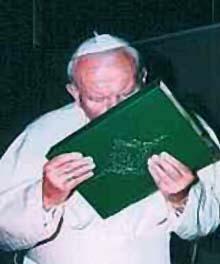 Pope John Paul proving that the pope is in-fact not infallible by kissing the Koran, the “holy” book of Muslims that blasphemes the name of our Lord Jesus Christ. A book that recently came out declares Pop John Paul II to have a special belt that he would whip him self to be “a sharer in the redemptive suffering of Christ”. The book writer Slawomir Oder wrote that “In the closet, among the cloaks, a particular pant-belt hung from a hook, which he utilized as a whip and one which he always had brought to Castel Candolfo”. Oder at the time was the head of the council that judges if Popes should be given the title of &quot;saint&quot; after they die. self-mortification, self-flagellation is not biblical. In bringing about the Redemption through suffering, Christ has also raised human suffering to the level of the Redemption. Thus each man, in his suffering, can also become a sharer in the redemptive suffering of Christ. [Jesus] suffered in place of man and for man. Every man has his own share in the Redemption. Each one is also called to share in that suffering through which the Redemption was accomplished. The rise of the Christian Church broke up the intellectual pattern of the classical pagan world. By persecution of this pattern’s ideologies it drove the secret societies into greater secrecy; the pagan intellectuals then reclothed their original ideas in a garment of Christian phraseology, but bestowed the keys of the symbolism only upon those duly initiated and bound to secrecy by their vows.